Looking for additional protein characterization? Give our Thermal Shift Analysis assay a try! | Proteos, Inc.
Proteos now offers multiple Thermal Shift Analysis assays for additional characterization of your protein or antibody product. 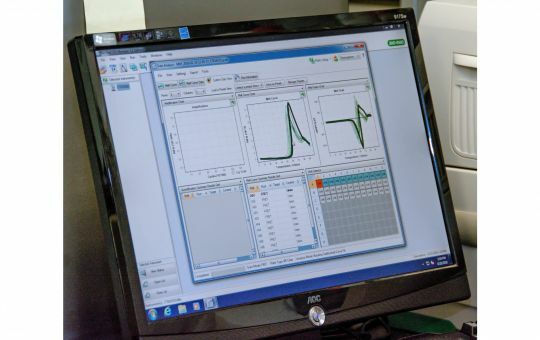 Thermal Shift Analysis assay services can be ordered as a stand-alone item (https://www.proteos.com/order#assay-services) or added as an additional analytic component to our protein production packages or custom protein and antibody production services. Custom Thermal Shift Analysis experiments can be designed to aid researchers in the selection of stabilizing reagents and buffer conditions for your specific project requirements. Thermal Shift Analysis is a thermal denaturation assay for elucidating conditions that stabilize a protein in solution. Protein destabilization and melting is measured as an increase in fluorescence as hydrophobic binding sites within the protein become exposed during unfolding and bind a fluorescent dye in the assay mixture. The melting temperature of a protein (Tm) is identified as the temperature at which 50% of the protein is unfolded. The assay is performed in 96-well plate format, allowing many conditions (buffers, ligands, etc.) or protein constructs to be screened simultaneously. Conditions that cause the Tm to shift to a higher temperature are identified as stabilizing. Thermal Shift Analysis does not require a large amount of protein. A single melting temperature determination assay (AS-002) performed in triplicate requires only 200 micrograms of protein (0.2 mL at a concentration of ~1 mg/mL). Additional protein will be required for other TSA assays (AS-003, AS-004, AS-005, and AS-006) depending on the assay design. Thermal Shift Analysis assays can be ordered at https://www.proteos.com/order#assay-services. Questions regarding assay services and inquiries regarding custom thermal shift analysis services can be sent through our Contact Us link at https://www.proteos.com/contact. Results of a thermal shift assay for a representative protein formulated in a series of buffers that range in pH from 5-9.5. The left panel represents the raw fluorescence data and the right panel shows the first derivative curves. The peak minimum of the first derivative curves corresponds to the protein melting temperature. For the example shown, the stability of the protein increases with decreasing pH.